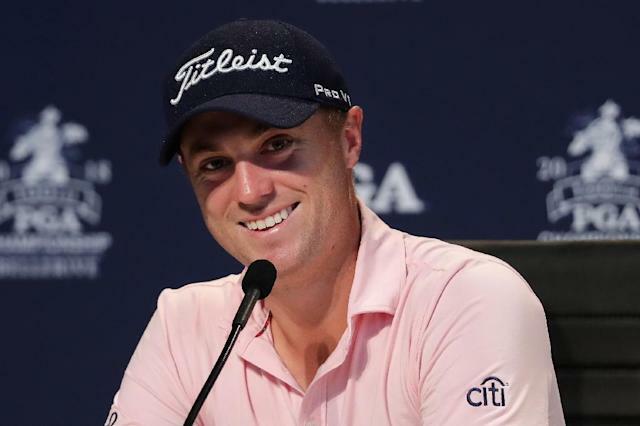 St. Louis (AFP) - A heart-to-heart talk with his dad and his caddie after missing the cut at the British Open helped Justin Thomas regain winning form ahead of defending his PGA Championship title. Second-ranked Thomas tees off in Thursday's opening round at Bellerive Country Club alongside 14-time major winner Tiger Woods and four-time major champion Rory McIlroy. "It will be pretty crazy out there. There's going to be a lot of people," Thomas said. "I enjoy playing with Tiger. I really enjoy playing with Rory. So it will be a cool week." The 25-year-old American comes into the event off a victory in last week's WGC Bridgetone Invitational after shooting 77 and missing the cut at Carnoustie two weeks earlier, which prompted a chat with caddie Jimmy Johnson and his dad Mike, a teaching professional. "It was a lot of me talking and saying it's hard and it's sometimes uncomfortable because the smallest things bother us," Thomas said. "Sometimes you don't feel like you should tell your caddie or coach or whoever. You're like, 'This person's going to think I'm so stupid for this'. "I told Jimmy things I wanted from him a little bit differently and I wanted him to tell me things he maybe wanted from me differently and I told my dad things I wanted from him differently. "So between the three of us, we came up with some different ideas we all felt each person needs to do for us to perform our best." One victory later, Thomas defends his first major title with a chance of overtaking Dustin Johnson as world number one if he can repeat. "The part of defending isn't as difficult as just winning the golf tournament in general," Thomas said. "It doesn't make it any harder that I'm trying to defend. The fact of the matter is it's hard to win." Only Woods has won the PGA Championship in consecutive years since it became a stroke-play event in 1958. Not since McIlroy in 2014 has a player won the PGA after winning a title the week before. Thomas, last year's PGA Player of the Year and top money winner, has two other wins this season -- the Honda Classic in February and last October's CJ Cup in South Korea. "If I play well, I'm going to have a really good chance to win," Thomas said. "I'm getting more confident in my chances of winning and understanding I don't need my best stuff to win. "I need to try to get myself in contention. That's the most important part when it comes to trying to defend a title. But being the deepest field in golf, a lot of players trying to knock off that major. "Any tournament's a tough one to win, but this one especially is." There's one perk of being the defending champion that Thomas enjoys that has not been the same when he has won events overseas. "Having a parking spot that I can pull into is nice," Thomas said. "Winning in Malaysia, in Korea, and in Sony (Open in Hawaii), those are events that we don't get cars. We get driven everywhere. So it's nice having one here this week."